With smart planning, painting and staining your outdoor furniture can take place in less than a weekend. There are many different types of outdoor furniture types—wicker, wrought iron, aluminum and plastic—but wood is by far the most popular. Whether you go with an opacity that allows your wood furniture’s natural grain to show through or opt for an opaque solid in your choice of 3,500+ colours, a fresh stain on outdoor furniture will yield a great new look. Staining and painting outdoor furniture is a lot easier with expert advice to guide you. Follow these steps to achieve the best results. The first step in staining or painting outdoor furniture is to make certain that the wood is absolutely dry and free of mould and mildew. Be sure to check the undersides, too. If the old surface has stains from mould or mildew, you can properly prepare it by using a premium cleaner like Benjamin Moore® Clean (318). For mild cases, you can mix up your own solution using one part of household bleach to three parts water (it's best to do this outdoors or in a well-ventilated area.) Be sure to rinse the furniture and allow it to completely dry before applying the stain. If the weather is cold, move the furniture indoors to dry; in milder weather, it's enough to place the furniture in a garage, carport, or other shelter from the rain. Don't cover the furniture with plastic or a tarp, as that will not allow enough air circulation for thorough drying. The next step is to sand the surfaces to be stained. If the old finish is in fairly good condition, it's enough to just roughen the surface. Start with coarse-grade sandpaper, working with the grain. An orbital hand sander is the perfect tool for this job, if you have one. If the old finish is in bad condition, you may choose to remove all the old finish down to the bare wood. This can be accomplished with a quality wood stain remover such as Benjamin Moore® REMOVE (315). If the old painted or stained surface is still intact after sanding, you can skip priming. 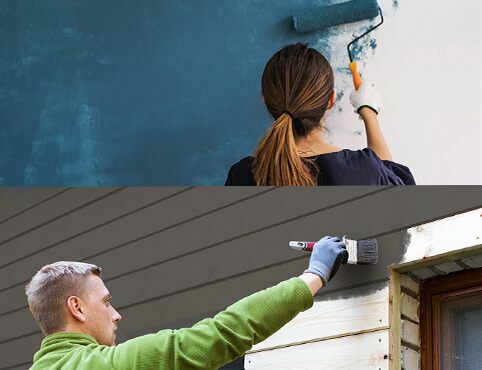 However, if you're going to apply a lighter colour over a dark one, if the wood is exposed, if there are knotty sections, or if any stains remain, you should use a high-quality primer formulated for outdoor use, such as Benjamin Moore's Fresh Start® High-Hiding All Purpose Primer (K046) or Arborcoat Oil Primer (K366). For all priming, brush on the primer working with the grain using a high-quality Benjamin Moore Nylon/Polyester brush. • The full Benjamin Moore portfolio of 3,500+ colours is available in Solid stain ARBORCOAT® Solid (K640). If you've primed the surface, one coat of stain will be enough. If you skipped the primer, you may want to apply a second coat. Let the furniture dry in a clean, dust-free, well-ventilated area. Don't leave it outside to dry, as wind and air may deposit dust and particles onto the wet surface. Once the furniture is dry, you're good to go. Situate your furniture where it won't be under a drip line from a roof or tree limb. An occasional light wash with dish detergent and warm water will help you enjoy your outdoor furniture for years to come. Get more color and design inspiration for outdoor furniture from our decks page. If you have wicker furniture, wrought iron patio furniture, plastic outdoor furniture, or questions on painting or staining any other type of outdoor furniture, visit your local, independently owned Benjamin More retailer to get expert prep instructions and product recommendations. 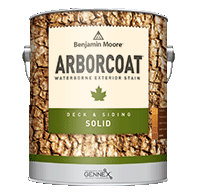 If you are staining outdoor wood furniture, consider a product that’s strong enough to protect decks: ARBORCOAT® Exterior Stain.